The Pekingese is an ancient breed of dog that originated in China. Despite the fact that this breed is said to be over 2,000 years old, its look has not changed within that time. The Pekingese was originally bred as a lap dog and companion. The Pekingese is also called The Lion Dog and the Peking Palasthund. Pekingese were the favored imperial companion of the Chinese dynasties. The gait of the Pekingese is unique to the breed. Breeders selected dogs that were bowlegged and developed this characteristic as a way to discourage the dogs from wandering off. As a consequence of the bowlegs, their characteristic rolling gait is very distinctive. 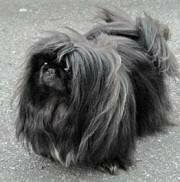 The Pekingese has a long, flowing coat of straight hair. The coat has elegant feathering and comes in all colors. This dog breed is allowed to come in all color combinations. However, Red sable is the most common color for this breed. Black and tan is also a popular color choice. The blonde color is preferred over the other colors for show dogs. Pekingese are small, with a height of 6-9 inches and weighing in at a light 8-10 pounds. This dog breed is classified as a member of the AKC's Toy Dog Group. The Pekingese was first registered by the American Kennel Club in 1915. Pekingese are ideal for apartment life. They are relatively inactive indoors and will do okay without a yard. 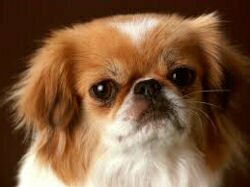 Pekingese do not necessarily want to exercise but they will stay in better health if they are given a routine of regular activity. Since these dogs already have a tendency for breathing problems because of their pug noses, you should use a halter and lead to walk your dog instead of the more traditional choke chain or collar. These dog breed will choose one person as their favorite and ignore the other family members. Pekingese are also jealous, which makes them a poor choice for a home with multiple dogs. Socialization training can help with this breed's behavior, but it is better to choose a more family oriented dog. The Pekingese requires daily combing and brushing to keep its long double coat matt free. Be sure to brush around the hindquarters, which can easily become matted. See the dog groomer once every 3 months to get a proper trim for this regal animal. You may want to use a dry shampoo regularly to keep your dog odor free. Clean the face and eyes daily to prevent staining. Pekingese are average shedders, but proper grooming should alleviate most of the loose hair. Pekingese seem to know they are Royalty! A novice might find these dogs difficult to train. An early puppy obedience class would be beneficial to both the new owner and the puppy. The personality of the Pekingese is sometimes stubborn and aloof. This is not a dog for an owner who needs a responsive, tail wagging little dog that will shower its owner with attention. This regal attitude might make these dogs unsuitable for the first-time dog owner. Some potential health problems for the breed include eye issues and breathing problems. These problems are the result of the breed's tiny skull and flattened face. Some Pekingese develop skin allergies and hotspots. An especially common problem in the Pekingese is an eye ulcer, which can develop quickly. If you don't have a large family and only want one dog, the Pekingese may just be the perfect breed for you.